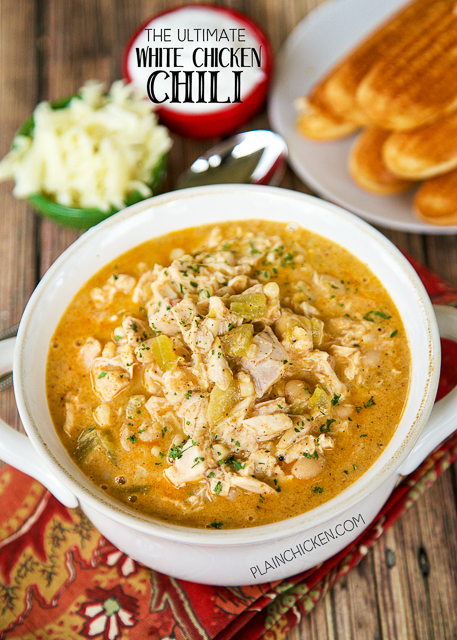 The Ultimate White Chicken Chili - the BEST of the BEST White Chicken Chilis! SO good and ready to eat in under 20 minutes! Rotisserie chicken, white beans, corn, green chilies, chicken broth, onion, garlic, cumin, chili powder, half-and-half, pepper jack cheese. Top with some sour cream and extra cheese. Makes a ton. Freeze leftovers for a quick meal later.